If you are carrying out projects and developments in the Midlands and need reliable grab hire, then you can count on the commercial vehicle hire experts at ND Brown. With five fully stocked depots across the UK, we can offer commercial vehicle hire to sites of all kinds. From our base in Wolverhampton, we provide the ultimate service for grab hire in the Midlands, giving you a top class hire, perfectly suited to your needs. Whether you need grab hire in the Midlands for carrying out extensive developments over a long period of time, or just need a one-off rental, our fleet of commercial vehicles is prepared for every eventuality. Each vehicle available for hire features fixed side, heavy-duty bodies which can take the toughest payloads in their stride. Why not take a look at our fleet, and find out more about the vehicles we supply – you can even fill in our Booking Request Form if you already have a good idea of what you need in terms of grab hire in the Midlands. 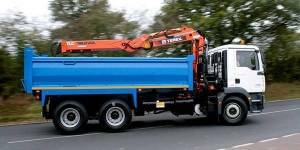 If you need any further information on our grab hire in the Midlands, or any of our other commercial vehicles, just give us a call. Furthermore, we also provide sales of commercial vehicles, which may be the most cost effective solution for your business. Give us a call, and our teams will be happy to discuss your options.